The church is a unique monument of the Saxon Renaissance because it has been preserved in this building style to this day almost unchanged. The most valuable part of the furnishings is the main altar with alabaster reliefs, whose central motif is the unusually elaborated family tree of Jesus Christ. The beautiful rib net vaulting of the church refers to a hundred year earlier building tradition, while the diamond portals are a typical feature of the Renaissance. 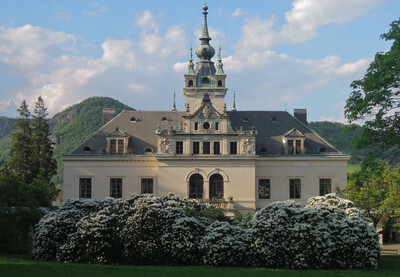 The double-height tribune galleries relate to the Protestant denomination faith of the estate owners, the knights of Bünau. 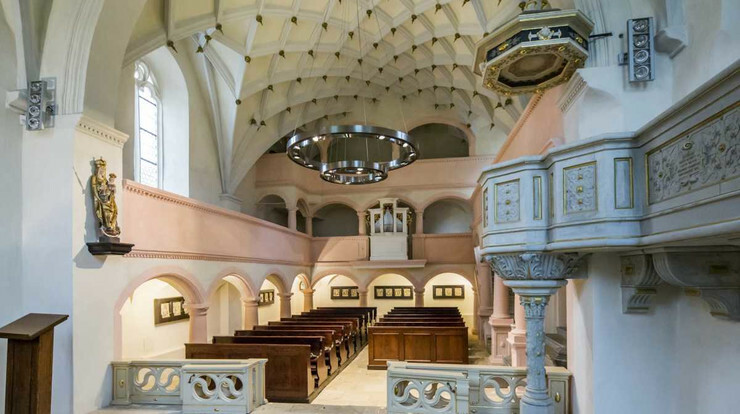 Church tour: A tour of the church nave, matroneum, permanent exhibition of the church’s history in the connecting point and an exhibition of artefacts in the room beneath the church’s roof with the nobility’s matroneum (accessible through the cemetery and bell tower).